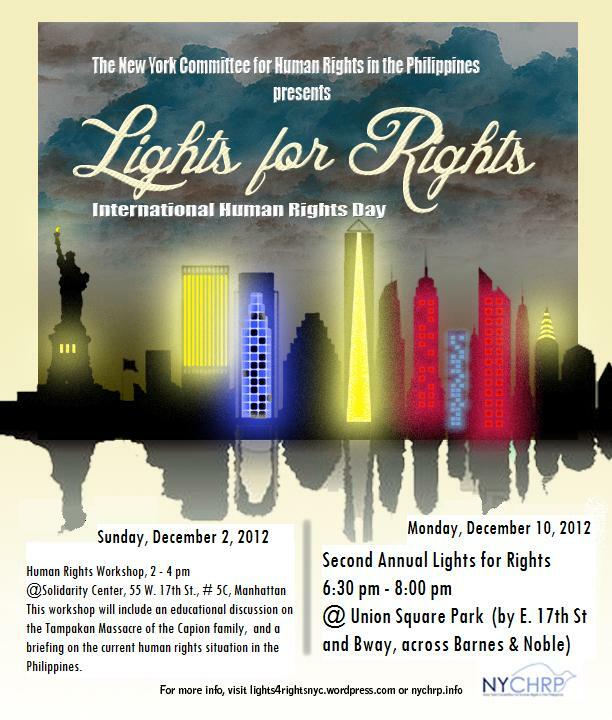 Join us on 12/2 for Human Rights Workshop & 12/10 at Lights for Rights! Please join NYCHRP for these two events as we approach International Human Rights Day, December 10th. This workshop will include an educational discussion on the Tampakan Massacre (Capion family), the abduction of Melissa Roxas, and a briefing on the current human rights situation in the Philippines. Join us in paying tribute to the victims and survivors of human rights violations with our interactive, informative props and commemorative glowstick “candles” to light the path for human rights. Submit an honoree for this event here. Previous Post 12/10 – Lights for Rights in NYC!